This recipe uses chicken thighs which are cheaper than chicken breast and, in my opinion, much tastier too. You COULD use chicken breast if you want but, honestly, having tried this recipe with both, the thighs always taste the best! I’ve found this recipe at BBC Good Food site. This recipe contains some of my favorite ingredients and is a great all-in-one meal because you don’t need to serve it with anything else. In my book, that makes it perfect because, when I get home from work, I just want to dig into a healthy, delicious meal and not spend extra time cooking rice or pasta. This could be one of my favorite dinners and I think, when you try it, it’ll be one of yours too. 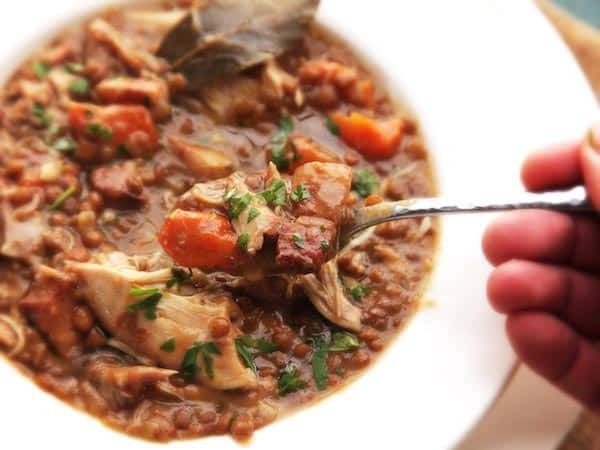 Note: If you don’t have a slow cooker: you can use your oven, learn how to convert this recipe for oven here. Or you can buy a slow cooker, check my favorite and my recommendations based on size, features and price here. Picture credits to Serious Eats. First, brown the chicken thighs in a frying pan for about 5-10 mins so they turn a good golden color. Remove and set aside. Next, add the bacon and shallots to the pan and brown – 3-5 minutes should be enough. Put everything apart except the buttermilk, lemon juice and one tablespoon tarragon into your slow cooker. Cook on Low 6 hours so the chicken is really tender and falls easily off the bone. Once cooked, remove the chicken, bacon and vegetables using a slotted spoon and put to one side. Add the buttermilk to the remaining liquid and, using an immersion blender, blitz until smooth. Add the lemon juice and remaining tarragon. 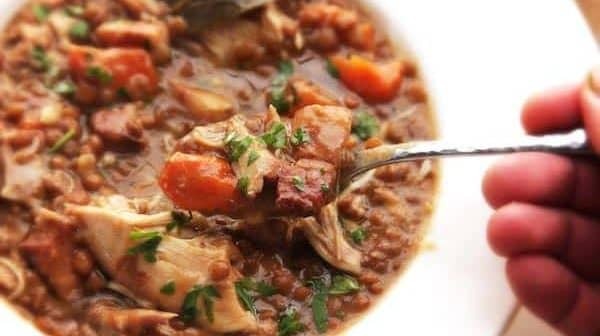 Season to taste and then put the chicken, bacon and vegetables back into the crockpot to keep everything warm until you are ready to serve. Find more recipe to inspire your moments. Invite your friends and family, prepare healthy delicious meals and impress them with easy recipes. All my slow cooking recipes here. Previous ArticleAre Meal Shakes Suitable for Athletes and Exercisers?